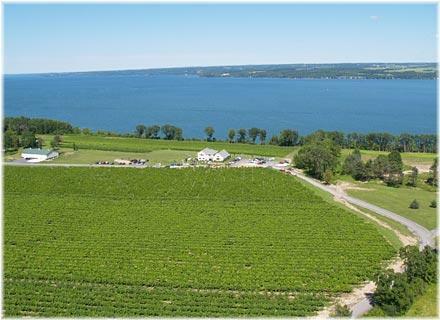 Thirsty Owl Wine Company is a destination winery, midway up the West side of Cayuga Lake, dedicated to producing high quality wines. With 150 acres and over 2,000 feet of lake frontage, visitors can taste fine wine and enjoy breathtaking views of the lake and vineyards. We have both mature plantings and several new acres planted in prime growing areas that border the lake's 300 feet plus waters. The water's ability to regulate air temperature lends to a meso climate that produces exceptional wines. Thirsty Owl offers tastings, a gift shop, and a bistro which operates seasonally. Our knowledgeable staff offers Thirsty Owl's great wine and food in a fun and friendly atmosphere, while providing the unforgettable experience of visiting an exceptional wine region. Subtle tones of smoked nut and smoky mineral accent easy fruity yellow-apple and grapefruit flavors in this delicate off-dry Riesling. A burst of sunny lemonade acidity brightens the midpalate leaving a brisk, clean finish. From the steep hills of Cayuga Lake, this flavorful Riesling is full of Finger Lakes character. Stone fruits on the nose give way to lemon-lime vibrancy on the tongue. It’s a juicy and delicious new offering from New York State. A sweet finish, bursting with fresh grape flavors and aromas. Spry lemon and white grapefruit flavors are stark and steely in this dry-style Riesling. It's not deeply concentrated on the palate, but refreshingly quaffable.
" You can’t smell sweetness of course, but the Thirsty Owl Wine Company 2012 Riesling does offer the impression of subtle sweetness on the nose, which is dominated by ripe and candied peach flavors with notes of musk melon and green apple. The palate, while well-balanced, lacks a bit of tension.